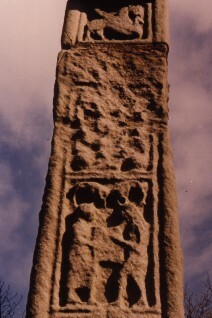 This is a close up of the shaft, south side, Tall (or West) cross at Monasterboice. (?) Elizabeth and Zacharias, and the infant John the Baptist. For further discussion see Harbison, 1992, p.149. Edwards, Nancy, , ‘An Early Group of Crosses from the Kingdom of Ossory’. In Journal of the Royal Society of Antiquaries of Ireland (1983) 1, 5-46. Roe, H.M., , ‘Muiredach's Cross, Monasterboice’. In Ireland of the Welcomes , January-February 1963 (1963) 2, 5, 17-21.